The story I’m about to share featured in a case study we recently published about our work with Yammer. It got me thinking about something Ursula (the protagonist in the story) did that all business leaders are trying to achieve. Have a read and let’s have a look. Ursula Llabres had just 10 minutes to communicate her message to 200 Microsoft sales reps. In 2012, Microsoft acquired the enterprise social network, Yammer, where Llabres works as a customer success manager. Her objective: help Microsoft Office365 ‘Black Belts’ understand the value and impact of Yammer. At the event, Llabres shared two customer stories. During a day packed with back-to-back sessions, her presentation stood out from the rest. “It was the only talk all day where people closed their laptops and listened,” said Steve Hopkins, Director of Customer Success for Yammer’s Australia region and a colleague of Llabres’. When Llabres finished, hands shot up with questions and Microsoft requested a follow-on impromptu Yammer 101 session for later that day. Reps approached Llabres with more questions and requests to connect on Yammer. The approach Llabres and her Yammer colleagues took to preparing and delivering their messages varied significantly from other speakers that day. In a world full of information the scarcest resource is attention. Unlike information it’s a finite resource because only people can provide attention and there are only so many hours in the day. And with smartphones buzzing, screens blinking, colleagues popping in for a chat, there are now so many more ways for our attention to be diverted, or even diluted. sharing stories is a different way to communicate in most corporate environments. It was a surprise. It sounded and felt difference to all the death by PowerPoint presentations on the day. And as Steve Jobs knew so well, we love surprises. sharing a story is a pull strategy, meaning that when you share an opinion or a viewpoint you’re pushing your ideas at the audience, and they tend to push back. Whereas when you share a story the audience tends to pull the story towards them and visualise it happening. The audience relives the experience with the storyteller and in the process becomes engaged in what’s been shared. professionals appreciate that we learn most from experience and really value hearing what actually happened. A story is simply an account of what happened with something unanticipated happening. A good story helps the audience visualise what happened. And a great story helps the audience feel what happened. Once Ursula gained everyone’s attention she was able to help them imagine what happened and even help them feel an emotion such as pride, curiosity or admiration. By piquing an emotion the audience has a much greater chance of remembering what Ursula said. And even if they don’t remember the details they will remember the feeling that Yammer is interesting, doing good things and valuable to its customers. Great post. My first thought is: I really want to know the stories Ursula told! Then I wondered ‘what is it with those bears? I really like the inverse information/attention idea. Although it does remind me of the similar question: do we actually have less time or is it just the choices we make? Let me start with the bears. 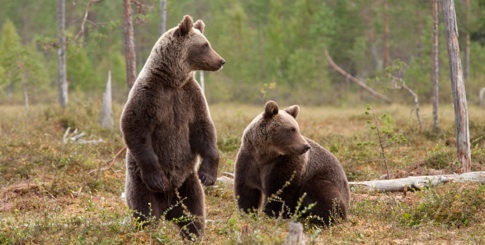 This might be a long bow, but I chose this photo because a bear catching a fish is our logo for Storytelling for Leaders plus these two bears clearly have their attention drawn to something stage right. Yep, a little obscure. I can see that now. Do you know Steve Hopkins at Yammer? His twitter handle is @stevehopkins. He could tell you the stories that were told. Like Kate, I also noticed the bears and assumed that you had chosen them to link to the name Urusula (meaning ‘little bear’). The visual connection certainly made me remember her name. It’s another powerful aspect of storytelling: the ability to conjure up vivid internal ‘pictures’ that reinforce memories.